Face Value: This cover is just lovely. I love the colors and I think the silhouettes of Há and her beloved papaya tree are both perfect for the story and beautiful artwork in and of themselves. The inside cover is compelling too. The overarching phrase, “No one would believe me but at times I would choose wartime in Saigon over peacetime in Alabama.” draws us into the story before the book even starts. This is definitely something I would have picked up off the shelf even if it hadn’t been recommended to me. Does it Break the Slate? Absolutely yes. Há is smart and tough and honest and angry. She doesn’t let anyone push her around, whether it’s her brothers, her classmates or her teacher. This girl is up against some astonishingly tough challenges, and she (with some help from her family, neighbors and new friends) proves herself better than to be defeated by even the worst of them. What really makes this book stand out for me though, is not just the strength of our main character, but her ferocity and anger. Há is no tragic victim, waiting for someone to take pity on her. She is angry about leaving her home, angry about feeling stupid when she used to be one of the smartest kids in her class, angry about being treated cruelly by her classmates, angry that her father isn’t with them. She takes her anger out on, not just the people who treat her badly, but the people she loves. So many girls in books, especially “Girls in a Crisis Situation” are written as these virtuous victims to only be pitied, that seeing Há respond with fierce, unrepentant anger struck me immediately. Certainly her situation inspires pity, but her reactions inspire a relatability that deepens our connection with her and brings her story to the next level. Who would we give it to? I’d love to see this book read in 4th-6th grade classrooms, especially in my community. I think it would play big in classrooms with significant immigrant populations and spark some great dialogue, while the historical distancing could keep it from hitting too close to home or raising parent/administrative concerns about politicizing (hey, I live in Arizona, I think about these things). I also would love to give this book to young people who are struggling to read on grade level. The sparse language and lots of white space would make it an accessible read, but this is clearly not a book for little kids. So with these things combined, think about what a perfect choice this for an English Language Learner! Here is a book that kids can connect with personally and emotionally, is age appropriate and uses a small enough number of words on each page that most things can either be understood or looked up without losing too much momentum. The fact that this is a novel featuring a definitively female protagonist that could easily be read with universal empathy by both genders is Slatebreaking in and of itself. Review: Novels in verse are tricky things. Sometimes they work brilliantly, other times it not only falls flat, it feels like meaning is being forced on us through the poeticism. 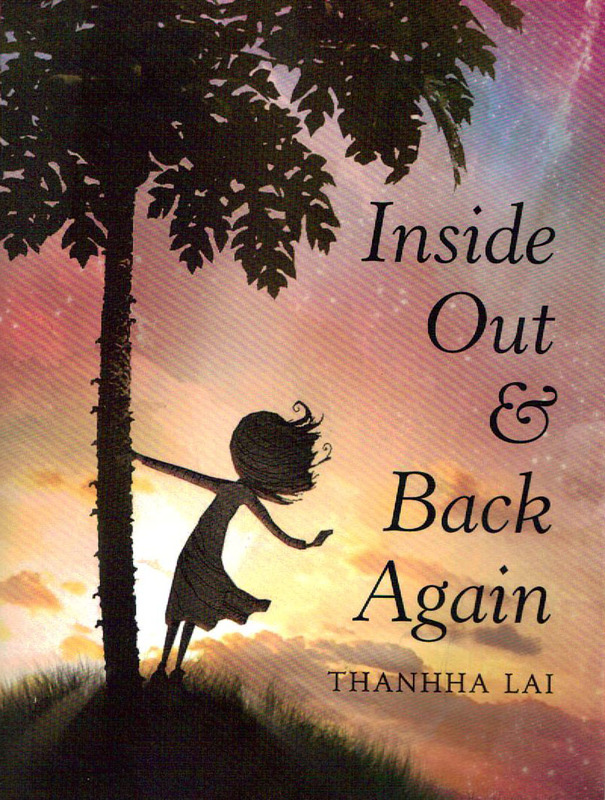 Inside Out & Back Again is one of those brilliant ones, where the poetry feeds and deepens the narrative, and allows us perspective and insight on the characters that prose wouldn’t be able to offer. Há’s story starts in Vietnam in 1975. Her father is missing, but the rest of her family is getting by day to day. She goes to school, bickers with her older brothers and tends for her papaya tree. But after the end of the war they have no choice but to escape. They make a harrowing journey to the United States and end up being sponsored as refugees in Alabama. Here, they have to contend with an overwhelmingly different culture and not always kind neighbors, learn English, and find a way to make their lives move forward without everything they used to have. Seen through Há’s eyes, we have the advantage of her perspective, showing us both the large scale emotional events (the family’s conversion to Christianity to be both sponsored in the first place and accepted in Alabama culture) and small scale shocks (fast food chicken is disgusting and unrecognizable to the fresh chicken she knows from home). and scars grid my knees. to beat Saigon’s heat and lice. Wish I could lose my chubby cheeks. that Brother Quang wouldn’t be so angry after work. Same honest reflection as the earlier version of Há, but here we see our heroine has grown up and been transformed by the changes in her circumstance. Her wishes reflect herself, but also wishes for her family, and for the larger scope of her surroundings. The subtle differences in language reflect her experiences, sadnesses and personal growth. careful to hiss every s.
I need to cut myself off here, or I will end up quoting this whole book at you. And really, you should just read it for yourself, in it’s full narrative form, instead of pieced together by me. Trust me that the language, the character and the story will win you over before you make it halfway through. This entry was posted in Middle Grade, Reviews and tagged Historical Fiction, Immigrants, Middle Grade, Poetry, Reviews, Thanhha Lai. Bookmark the permalink.